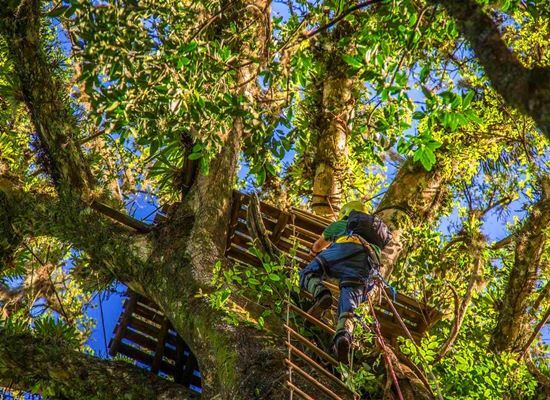 This trip would suit well with hikers and those who are looking to have an active holiday. 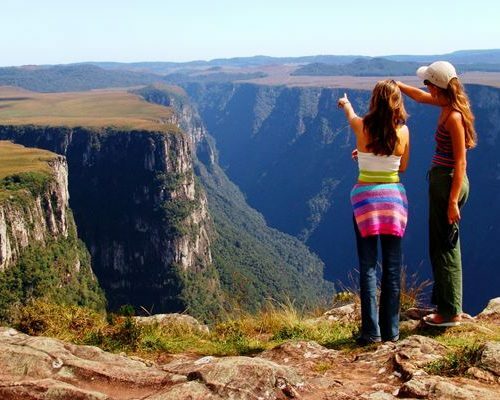 The Aparados da Serra canyons, scattered across two states in the south of Brazil, Rio Grande do Sul and Santa Catarina, hold one of the most fascinating landscape in the country. Here, the wide mountains form edges and abysses up 1.200 meters high, looking like if sharpened by a knife. At the bottom there are crystal and waterfalls. 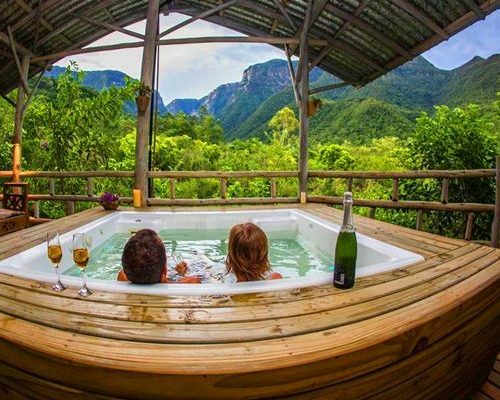 You will stay at the charming Pedra Afiada Ecological Reserve – an intimate getaway for those who crave a close connection with nature. Breakfast and dinner are included in the daily rate as there will be plenty of snacks for the hiking part. 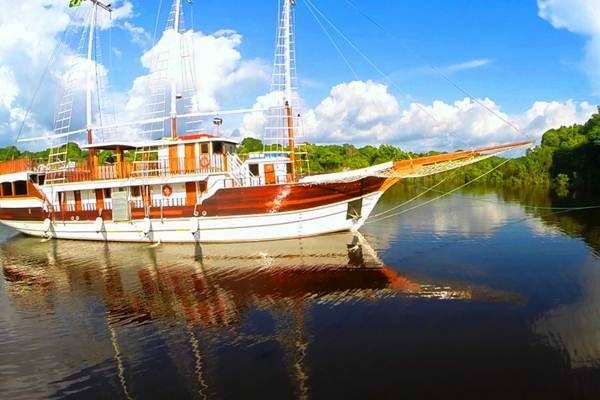 A super great-value, scenic trip into the South of Brazil. 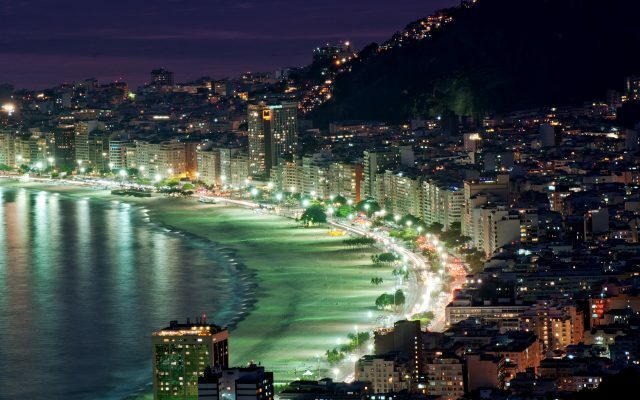 Today you will be picked up at the airport, either in Porto Alegre or Florianópolis and will be transferred to Praia Grande (3 hours) across a scenic road. After check-in at Pedra Afiada Ecological Reserve you will have free time to know the place and enjoy the views. Dinner is included. Today head out to trek over the rocky river of the Malacara Canyon, looking from the bottom at the high basaltic walls, up to the natural pools (about 3 hours). Return to lunch (included). 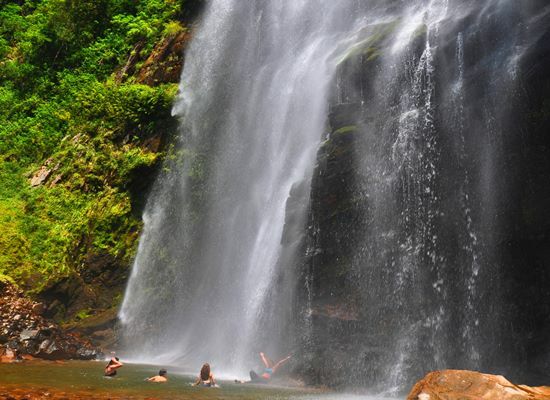 In the afternoon take the trail to explore the Atlantic forest, passing by Jaguar’s waterfall. Refresh yourself in the beautiful natural swimming pool. Upon returning to the posada we suggest to try a relaxing sauna. Dinner included. 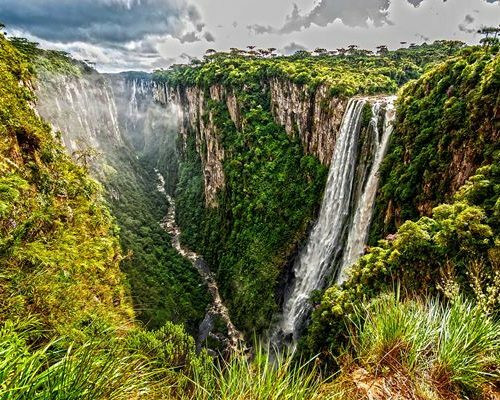 Today take a look at the iconic Itaimbezinho Canyon from the top. Later on trek through the trails of Vertice and Cotovelo. Stop for a snack (included). 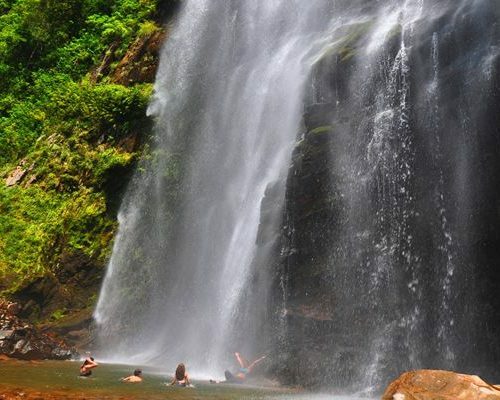 On the way back, after an easy walk you will see a wonderful waterfall located in Indios Coroados Canyon. Upon return to Praia Grande balance the rest of the day at leisure. Dinner included. 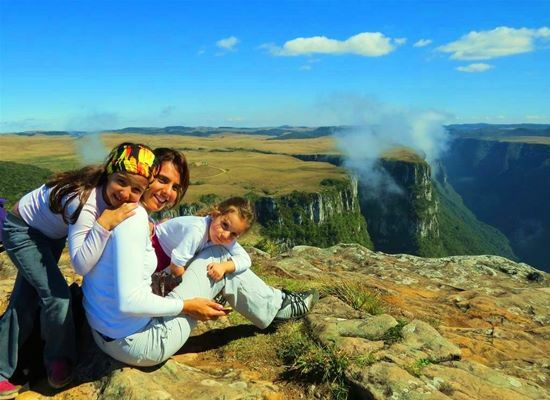 Today you will leave early to the Fortaleza Canyon (2 hs) on a full day of amazing sightseeing. 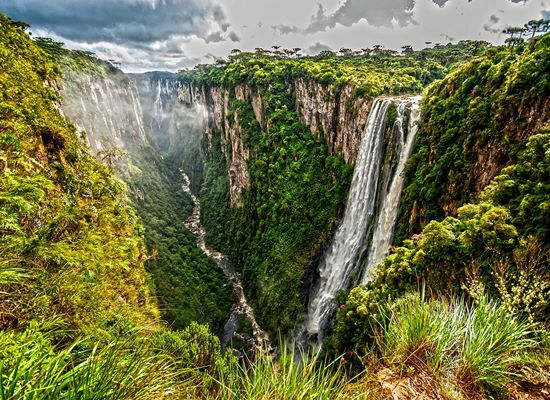 This is one of the most amazing canyons due to its size (30 kms) and height (up to 1.200 meters). 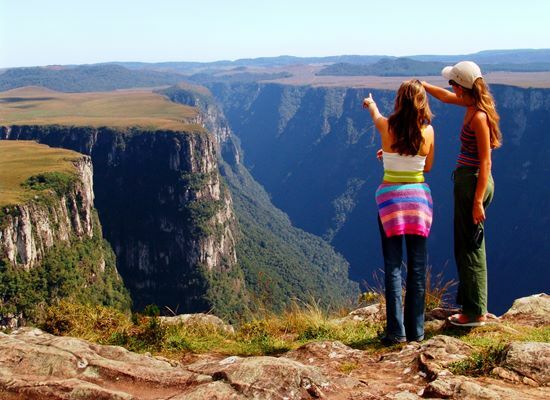 Here you can have a view of the coasts of Rio Grande do Sul and Santa Catarina. 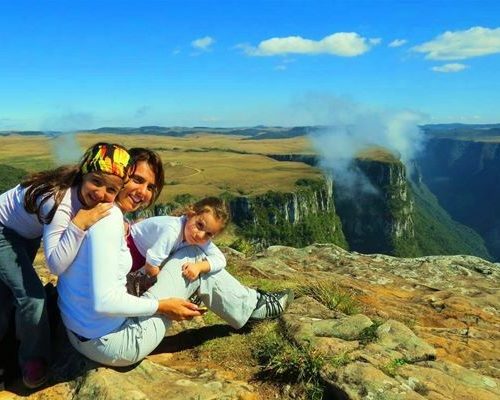 Trek to the Quebra – Cangalho hill (highest point), Tigre-Preto waterfall and the Segredo stone (a 5 meters tall monolith balancing on a small base). Stop for a snack (included). Upon return a delicious dinner will be ready for you. 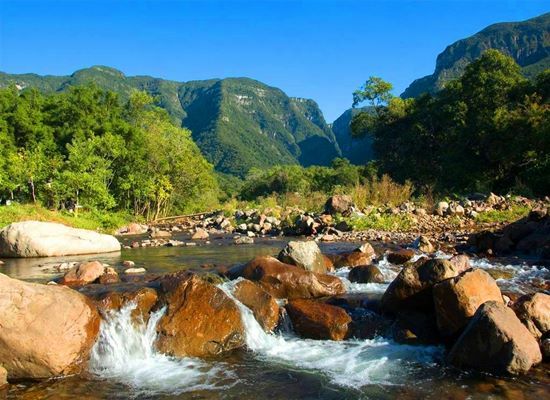 After breakfast you will have a full day of exiting trekking through the Rio do Boi trail (inside Itaimbezinho canyon). You will see the canyon from an angle known only to a few: from the bottom to the top. You will trek the whole day through the Rio do Boi trail, into the river. It takes about 6-8 hours going through natural pools, waterfalls and slides. A trail snack is included. Upon return to the posada relax and prepare for a delicious dinner. 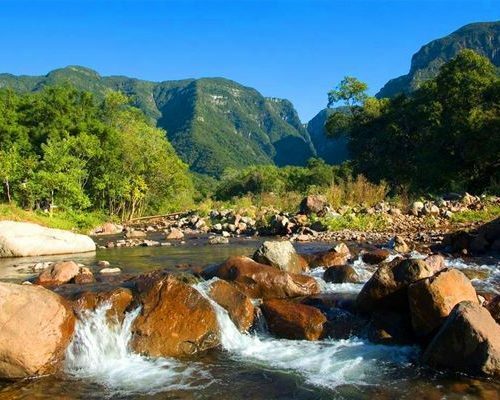 Today you will visit Mampituba to visit one of the most beautiful waterfalls in Aparados da Serra, located in a majestic patch of primary Atlantic forest. There is a 30-40 min trail uphill and downhill. 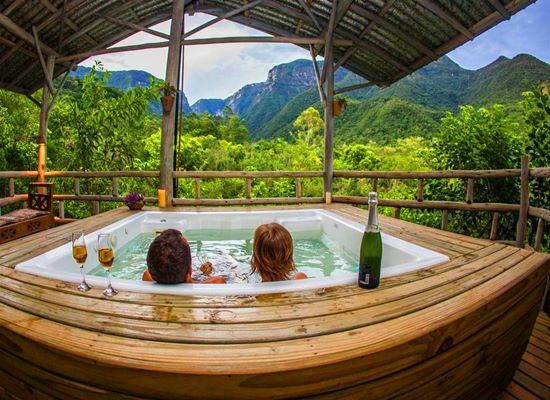 You will have a chance to bath in the waterfall and the natural pools. There is a restaurant, shop and restrooms in the area. Lunch is not included. 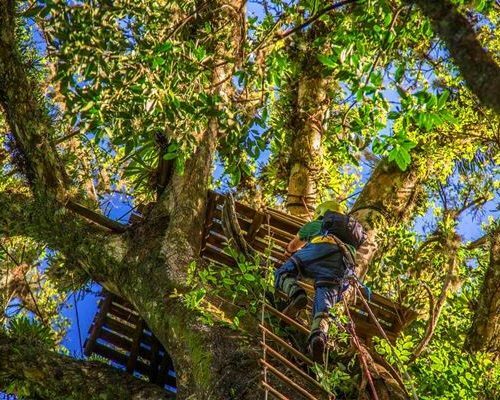 Upon return to Pedra Afiada spend the free afternoon at leisure or choose an extra activity such as ATV, canopy walking , cycling or just relaxing in the hammocks. Dinner included. Your departure is flexible and you can balance the morning and afternoon at leisure. A transfer out to the airport will be organized according to your onward travel arrangements. International and connecting domestic flights are not included. 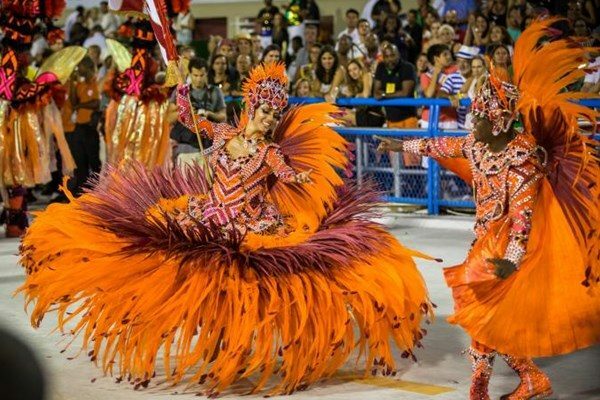 You can get all the flights return from £700 per person. Do ask us for advice. Alternatively we can book the flights for you but a booking fee may apply.